Let’s face it – knives can be so expensive. Purchasing one pricey knife is hard to swallow for ordinary home cooks. Thankfully, value-for-money sets of knives exist to satisfy budget-conscious people that also need something of high-quality. Since one knife can already be a pain in your wallet, why not shell out a little more to buy several knives in just one purchase? 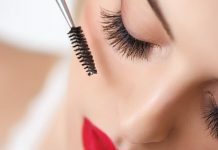 That way, you would feel more comfortable spending a huge amount of money for multiple items. To see what most people are buying right now, check out the best kitchen knife set in today’s market! Cuisinart Advantage Collection Knife Set has blades that are surprisingly composed of stainless steel with excellent quality. The metal blades are not obvious because of the coating that makes them non-stick for easier slicing. Regarding the colorful number of knives, it helps reduce the possibility of cross-contamination caused by unorganized food preparation. This kitchen knife set has free blade covers to avoid contamination during storage. It includes an eight-inch chef’s knife, an eight-inch slicing knife, an eight-inch serrated bread knife, a seven-inch Santoku knife, a 6.5-inch utility knife, and a 3.5-inch paring knife. 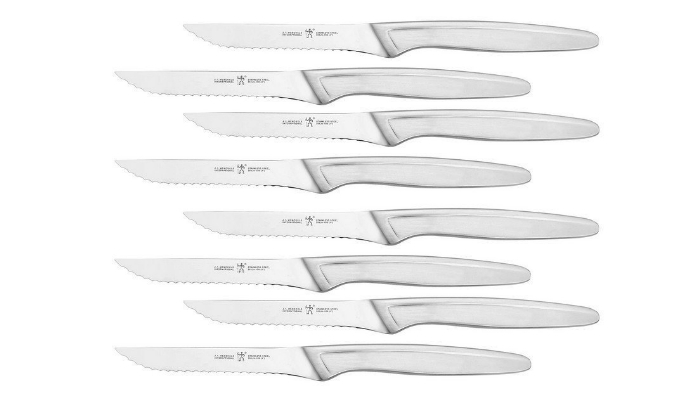 Chicago Cutlery Fusion 18pc Block Set is a great combination of style and precision. It has super-sharp knives with blades forged with high-carbon stainless steel. These blades also stay sharp for a long time, thanks to the unique feature called Taper Grind Edge Technology. When it comes to perfect control and balance, the knives have poly handles for added comfort and grip. Unlike other kitchen knife sets, this one has an unbelievably wide range of types for almost every food prep task. It provides professional quality for home cooks’ delight. ZWILLING J.A. 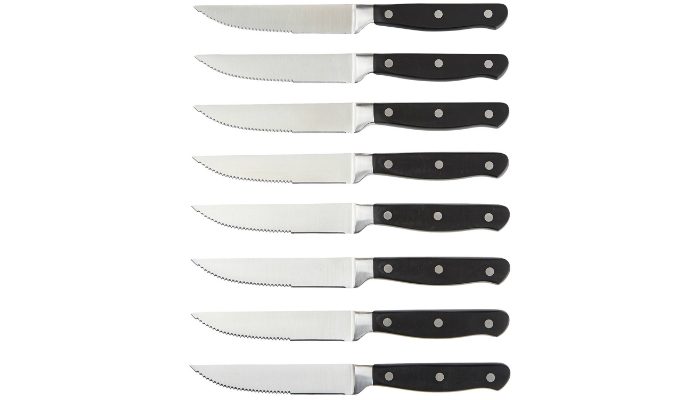 Henckels 8-Piece International Stainless Steel Steak Knife Set is resistant to corrosion. Each knife follows one-piece construction with full tang. Its serrated edge never requires sharpening. 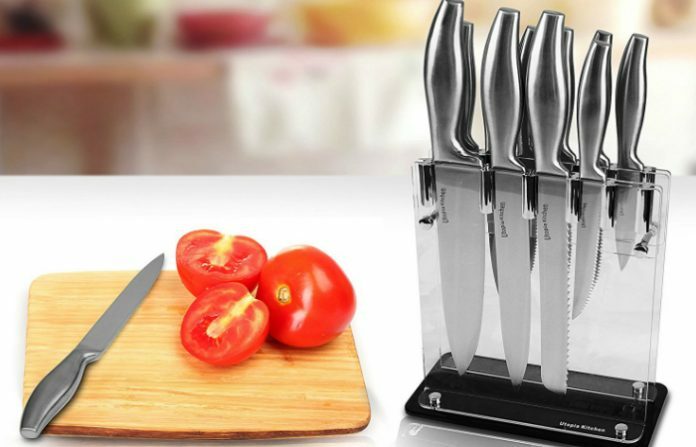 This kitchen knife set is dishwasher-safe for easier cleaning. AmazonBasics 8-Piece Premium Steak Knife Set has superior quality because of its knives’ triple-riveted handles, micro-serrated edges, stain-resistant metal, and full tang for balance. Utopia Kitchen Premium Class Stainless Steel Kitchen Knives Set is resistant to tarnish and rust. It includes an eight-inch chef’s knife with 2.5-mm blade thickness, an eight-inch carving knife also with 2.5-mm thickness, a five-inch utility knife that is 2.5-mm thick, six pieces of 4.5-inch steak knives with 2-mm blade thickness, and a storage stand made of acrylic. 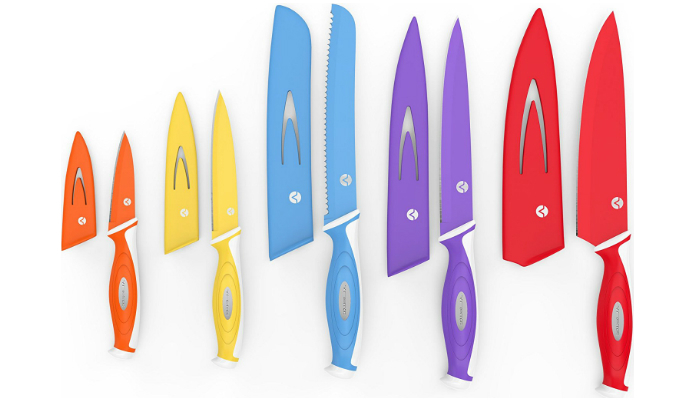 Vremi Colorful Knife Set comes in a beautiful vision of five bright colors and five basic types of knives namely chef’s, utility, serrated, carving, and paring. Its blades are so sharp that they are great for smoothly cutting bread, effortlessly peeling veggies and fruits, and thinly slicing meat and cheese. What makes them even better is their magnetic properties so you can mount them on a wall with the right kind of organizer. They are also free from harmful BPA and lead. 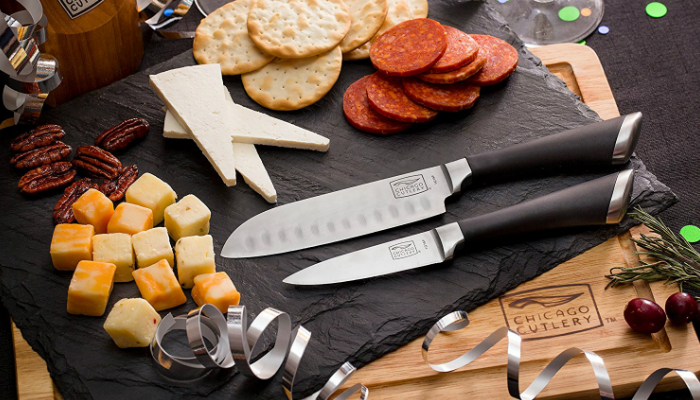 This kitchen knife set is a great affordable gift for home cooks. Since we are talking about knife sets in the first place, it is only natural to consider what should be included. There are three knives that every set must include: chef’s knife, paring knife, and the bread knife. The chef’s knife is usually the biggest one in most sets. It is the center of attention since it can do a lot of kitchen tasks. Meanwhile, the paring knife can be the smallest one in the group. It is designed to skin vegetables and do other delicate tasks. Obviously, the bread knife is for cutting bread without damaging the entire loaf or sandwich. It typically has a serrated blade. Sure, you can definitely buy these knives separately, but you would just spend more money. 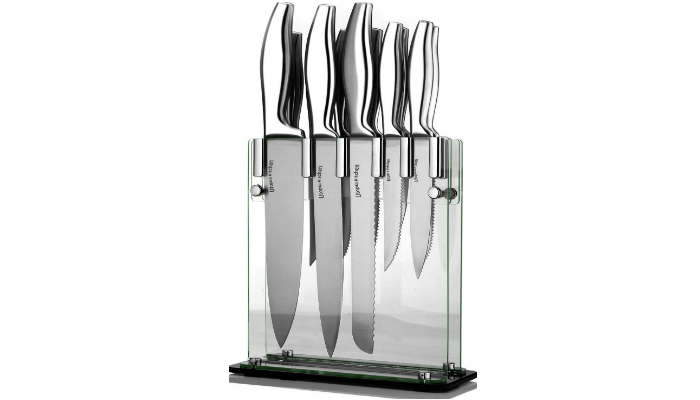 Knife sets are popular value-for-money products. Some of them even include a wooden block for storage, a sharpening steel, and a pair of shears. Others even have a bonus knife called the utility slicer. If the set you prefer does not have a sharpening steel, check out our take on the best knife sharpening stone sets. To use the sharpening set more effectively, learn how to sharpen a knife. Of course, we should also make sure that the knives in the set are all high-quality. The first part you should evaluate is the construction of steel. Carbon or regular steel is a very common material. However, it is not recommended since it rusts. That is unfortunate because carbon actually makes the blade strong. To balance out the effects of carbon, thank goodness for the existence of stainless steel. The best kitchen knife set must feature high carbon stainless steel blades. Aside from materials, quality also depends on the formation of the blade. Which is better: forged or stamped? Forged knives are created by heating, folding and cooling their blades repeatedly. They are much denser, leading to better balance and longer-lasting sharpness. On the other hand, stamped knives are just based on steel templates. Based on the aforementioned features, you can never go wrong with forged high carbon stainless steel knives. Just because knives are sharp and deadly does not mean that they are totally unsafe to use. The concept is simple: the sharper the blade, the safer the knife is. Danger enters the scene when the blade starts to get dull, and you are starting to put more force into the knife. 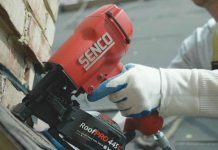 The rule of thumb is to let the blade do all the slicing and cutting while your hand is just maneuvering it. Another factor for safety is the handle. It should fit your hand perfectly. It should also have its own grip so you can maintain control even if your hand is wet. There is even a thing called finger guard to enhance your grip. The finger guard is located at the bolster, which is where the handle meets the blade. It is actually not a common thing for knives. Many products still have no finger guards. As an alternative, some big blades use a flat section that is not sharp at all. Unfortunately, slicers and other small knives can really cut your finger if they do not have a finger guard. 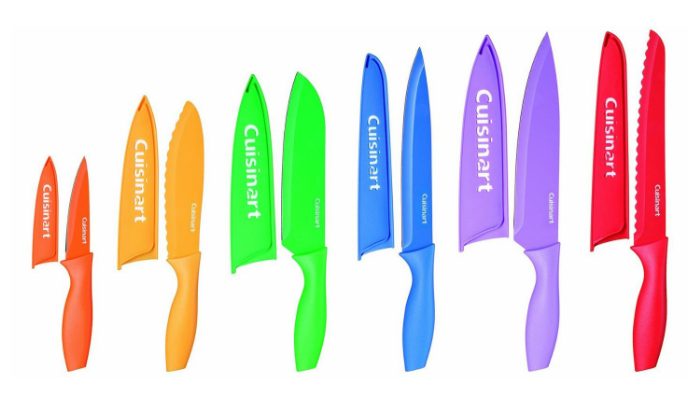 We selected Cuisinart Advantage Collection Knife Set as the best kitchen knife set for most home cooks. 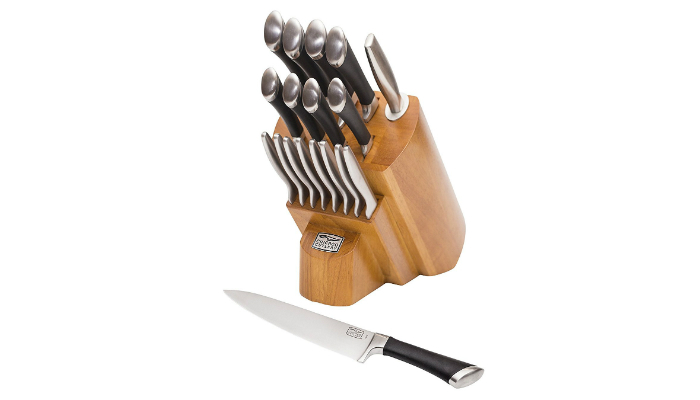 It has the big five must-haves for a knife set: quality, functionality, convenience, style, and affordability. In choosing the best kitchen knife set for your own needs and preferences, make sure to consider the overall quality, safety features, and components of the set. To learn interesting ways on how to use different kinds of kitchen knives, find out how to carve a turkey, shuck oysters, and fillet a trout. 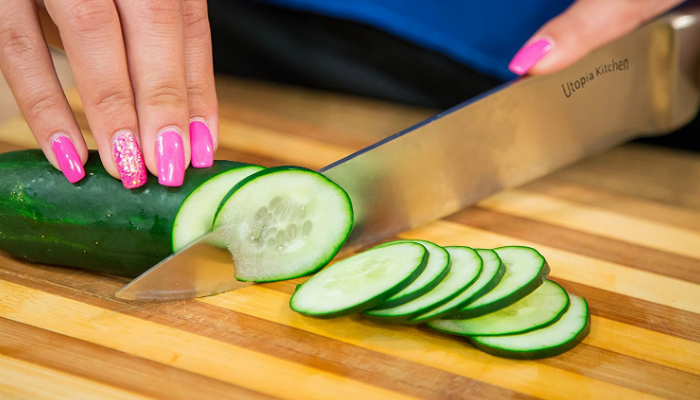 You may also check out our quick guide on how to hone a kitchen knife. Do you want to own a special kind of knife for self-defense and survival? We have a list of the best automatic knives.